The evidence that e-cigarettes help people quit smoking was described in the World Health Organisation’s (WHO) recent report as “scant and of low certainty”. Predictably, this triggered the latest round of claims and counterclaims in an ongoing, and often acrimonious, dispute about the potential of e-cigarettes. This lack of definitive evidence about either their efficacy or their long term health effects, outlined by the WHO, is echoed by others, including Australia’s National Health and Medical Research Council. Regulatory authorities outside Australia have classified e-cigarettes as medical devices or smoking cessation aids, similar to nicotine replacement therapy, like patches or gums. So far tobacco companies are the only actors to successfully gain medical licences for such products, although none have yet come to market. But the decision to seek medical approval for their products may have serious consequences. It may allow the industry to reclaim a role in health policy, part of a wider strategy by tobacco companies to rebrand themselves as nicotine companies with a key role in the fight against smoking. Policy makers who would shun overtures from Big Tobacco may nonetheless be prepared to meet with “nicotine companies” and producers of smoking cessation devices. This offers tobacco companies a significant opportunity to shape regulatory debates surrounding their core cigarette businesses, potentially undermining effective tobacco control policies which have driven declining smoking rates in Australia and elsewhere. The lack of definitive evidence about either e-cigarettes’ efficacy or long term health effects underlies the Australian government’s decision to implement a near-complete ban. Current regulations prohibit the sale, supply and possession of e-cigarettes containing nicotine. Regulation of the use of e-cigarettes in public places, their marketing and promotion varies by state, adding a further level of legal uncertainty. People can import e-cigarettes as an unapproved therapeutic good with a prescription. However, most vapers (e-cigarette users), are unlikely to visit doctors to access products readily available over the internet. Many vapers also reject the idea they are sick and need to be cured. Australia’s position differs from that of other jurisdictions. The European Union, for example, allows e-cigarettes to be sold as licensed medical devices or as non-medical products if they meet certain criteria set out in the 2014 Tobacco Products Directive. In the UK, British American Tobacco is the only company so far to have obtained a medical licence for an electronic nicotine delivery device, although its Voke brand is not yet on the market. This opens the possibility that UK patients could be prescribed tobacco industry products on the National Health Service. In 2013, British American Tobacco subsidiary Nicovations applied to the Australian Therapeutic Goods Administration (TGA) to have Voke licensed as part of its “medicines-based approach” to reduce the harms from smoking. When the TGA refused to evaluate its application, Nicovations successfully took the issue to the Federal Court, which in April 2016 ruled the TGA was required to consider the company’s submission. Another British American Tobacco brand, Vype, which is not regulated as a medical device, is sold in UK pharmacies alongside nicotine replacement products. It is being positioned – both physically and symbolically – as a smoking cessation tool. Do we need products to help us stop smoking? Current debates on e-cigarettes occur in a context in which quitting smoking has become defined as a treatable medical condition and the best way to stop smoking is to buy a manufactured remedy. This situation is the result of aggressive promotion by pharmaceutical companies that manufacture nicotine replacement therapies and other pharmacotherapy. Despite the reality that the overwhelming majority of ex-smokers quit without using pharmaceutical products, the manufacturers of nicotine replacement therapy have successfully shaped perceptions around how smokers quit, both in Australia and internationally. Tobacco companies’ investment in e-cigarettes builds on the medicalisation of smoking cessation. While some companies have invested in developing medical devices, the vast majority of tobacco companies’ “next generation” products, including e-cigarettes, are carefully differentiated from existing nicotine replacement therapies. They are positioned as smoking substitutes rather than overtly medical treatments. Indeed, the development of medical products may be intended to draw attention to the availability of non-medical substitutes, which are targeted at smokers who do not see themselves as unwell or in need of treatment but may be attracted by substitute products. Many smokers do not see smoking as a medical condition and, thus, have not been reached by traditional nicotine replacement therapy marketing and channels of distribution. The current developments in smoking cessation and the evolving corporate strategy of Big Tobacco means we need to be clear about the key issues and participants in current smoking cessation debates. 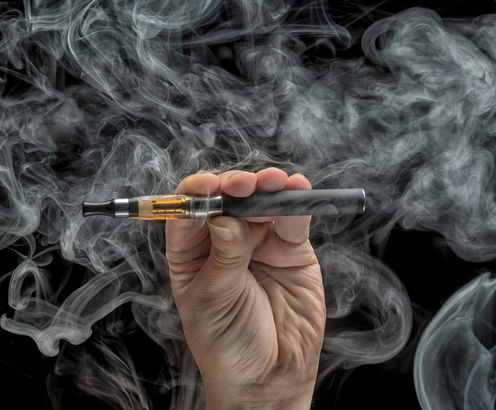 The marketing of e-cigarettes as smoking cessation products will reinforce misconceptions among policy makers and the wider public that some form of medical or non-medical replacement product is required to quit smoking. It will also reinforce the idea that to drive quit rates, it is both necessary and legitimate to engage with the producers of these products. Smoking cessation products display, UK (suppplied). Investment by tobacco companies in e-cigarettes raises important concerns regarding the renormalisation of the industry, and the impact on tobacco control policies. It, may, for instance, allow tobacco companies to reposition themselves as key partners in the health policy process in ways similar to the alcohol and food industries. While meetings between governments and the tobacco industry are precluded by Article 5.3 of the Framework Convention on Tobacco Control, tobacco companies will be able to argue such restrictions do not extend to their e-cigarette subsidiaries. Despite strategies to rebrand themselves as nicotine companies and technological innovators, the core business of the tobacco industry, and its sources of profit, remains firmly focused on conventional tobacco products. As such, governments should approach e-cigarettes and their producers with caution. Tobacco companies, including their subsidiaries, must be viewed as tobacco companies in all contexts, and governments should adhere to internationally accepted norms of non-engagement. Benjamin Hawkins receives funding from the US National Institute of Health (Grant No. R01-CA091021).